Space shuttle Endeavour is seen rolling into its new home, the Samuel Oschin Display Pavilion at the California Science Center in Los Angeles, on Sunday, Oct. 14, 2012. LOS ANGELES — Space shuttle Endeavour has come to its final stop — finally. The iconic black and white orbiter, which flew 25 times to space over the past two decades, arrived at the California Science Center (CSC) Sunday afternoon (Oct. 14) to begin its new mission as a museum exhibit. Endeavour had been scheduled to pull up at the CSC on Saturday night (Oct. 13), but natural and utility obstacles, as well as the need for maintenance of its transporters, slowed the pace of the shuttle's parade and delayed its arrival by a day. Not that many of the spectators who came out to see the shuttle roll by seemed to mind. "What a phenomenal three days," he added. "I may need some sleep, but it was a great three days." Arriving at Exposition Park at 11:30 a.m. PDT (2:30 p.m. EDT; 1830 GMT), Endeavour crossed the finish line of its extended three-day, 12-mile (19 kilometers) road trip from Los Angeles International Airport (LAX) by cutting across the grass on a plank-lined path to enter the CSC's Samuel Oschin Space Shuttle Display Pavilion. Endeavour reached the threshold of the hangar at about 2 p.m. PDT (5:00 p.m. EDT; 2100 GMT), where it was set to enter through the building's temporarily removed rear wall. Inside the display pavilion, Endeavour will remain atop the modified NASA overland transporter that served as the shuttle's chariot during its traverse of Los Angeles and Inglewood streets. "Nothing like this has ever been attempted before, and nothing like this will ever be attempted again," L.A. mayor Antonio Villaraigosa said in a press conference Sunday. "This was not just a once-in-a-lifetime event, this was a once event, and I'm heartened and we're all heartened at the reception that all Angelenos have given it." "Getting the space shuttle from LAX to the science center was no small feat. 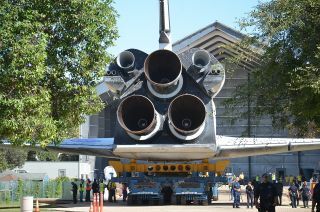 But you made the Endeavour's final mission a success," the mayor added. "Mission 26, mission accomplished." The science center plans to open Endeavour's display to the public beginning Oct. 30. Shuttle technicians, who previously readied Endeavour to launch again, instead worked to transform the shuttle from a space-worthy vehicle to a museum-ready display. They removed hazardous materials and also saved some of the orbiter's propulsion system hardware to be possibly reused on future launch vehicles. Last month, Endeavour crossed the country, flying piggyback from NASA's Kennedy Space Center in Florida to Los Angeles atop a modified Boeing 747 jumbo jet. The orbiter was then loaded onto the transporter and underwent a few final display preparations while temporarily sheltered in a United Airlines hangar at LAX. Early Friday morning (Oct. 12), Endeavour left the hangar at the airport and began its slow journey to the CSC. The road trip proceeded mostly on schedule until Saturday, when the narrow clearances around street corners, signs, buildings and trees on Crenshaw Boulevard resulted in a series of very slow precision moves. Dropping well below the 2 mph (3.2 kph) top speed of Endeavour's four computer-driven, self-propelled vehicles for the vast majority of the trip, the trek was also extended by needing to reconfigure the vehicles to straddle the medians on the wider roads along the shuttle's route. The four multi-wheeled vehicles were used for the vast majority of the journey. The exception was a brief spell on Friday evening (Oct. 12), when the shuttle was towed by a Toyota Tundra pickup truck to rebalance the weight before crossing over the 405 freeway. In addition to the crowd that gathered to see its arrival at Exposition Park, Endeavour was welcomed by two public celebrations on Saturday: a formal ceremony held at The Forum sports arena in Inglewood, and a dance tribute at the intersection of Crenshaw and Martin Luther King, Jr. boulevards that was choreographed by Debbie Allen. Due to the delay, the performance proceeded well before Endeavour entered the intersection. Although Endeavour will never fly into space again, it will return to a launch pad of sorts. The California Science Center plans to build the Samuel Oschin Air and Space Center, which by 2017 will replace the display pavilion as Endeavour's permanent home. In the new facility, Endeavour will be hoisted vertical and exhibited with a pair of solid rocket boosters and a replica external fuel tank to re-create how the space shuttle looked before liftoff. The temporary hangar and future center were named after the late entrepreneur and philanthropist Samuel Oschin, whose family foundation donated a "transformational gift" toward the $200 million the science center says it needs to complete Endeavour's exhibit. Toyota, through an existing partnership with the science center, has pledged to donate up to $500,000 through a "tweet-drive" on its Tundra Endeavour Project website. The CSC is also inviting its members and supporters to become a part of "Team Endeavour" by sponsoring one or several of the thousands of heat shield tiles that line the shuttle's underbelly. Those who donate $1,000 or more will receive a patch that was packed aboard Endeavour during its ferry flight to California, among other benefits. The science center is not charging an admission fee to see Endeavour when the pavilion opens. However, due to the volume of visitors anticipated for its debut, the CSC is requiring a timed entry ticket that carries a service charge of $2. The tickets can be reserved through the science center's website.